A home vegetable garden produces a cornucopia of colorful, nutritious, ultra-fresh vegetables through the summer. Tomatoes are summer’s most popular vegetable, and here are some tips that can help both seasoned tomato growers and newbie gardeners pick the fullest flavors from your plants. This spring brought plenty of rain to most gardens. That might change this summer – especially if El Nino gives way to La Nina. And droughty conditions can bring on blossom end rot, one of the most common challenges of garden tomatoes. Fortunately, blossom end rot can be avoided through maintaining proper soil and water conditions. First, be sure your soil pH is in the neutral range; for tomatoes, about a handful of ground limestone mixed into the soil at planting keeps most soils at the right pH. Second, avoid using high-nitrogen fertilizers, especially during plant growth. The plants might look beautiful – but too much nitrogen factors into blossom end rot. Third, keep your plants evenly and consistently watered through the summer. You may not be able to control the spring rains; careful summer watering will help keep blossom end rot at bay. The controls for blossom end rot – proper soil fertility, appropriate fertilizer and consistent water – are all good to maintaining tomato plant health. Healthy plants are some of your best guards against pests and diseases. 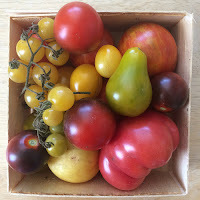 Many gardeners rely on old favorites for tomatoes – plants grown from seeds they saved and started, or purchasing plants from the local farm market or garden center. Expand your tomato patch with later plantings or varieties that will mature later. If you don’t have room in the garden for a new or later-maturing variety, try container-grown tomatoes on in full-sun garden bed or on a patio. This can be an easy way to keep cherry and grape tomatoes nearby your kitchen for easy pickings. Of course, there’s one danger: tomatoes on the patio might be picked and eaten before they ever make it inside! Our NEW EarthBox Garden System is the easy way to get started! It includes everything to get you up and growing your tomatoes and other vegetables quickly and easily — just about anywhere. Disease resistance is another reason to try new varieties. Varieties that are resistant to blight, mildew and other common diseases of tomatoes can help move your plants to harvest and can also lessen the need for disease controls. Fruit trees are moving past the time of danger from spring freezes. Now it’s up to you to coax the sweetest tastes from your fruit trees. Here are some keys to remember this spring toward a successful harvest this summer. A common failing for keeping home fruit trees is applying the wrong amount of fertilizer – and applying fertilizer at the wrong time of year. Fertilizer is best applied before bud break. A rule of thumb is one-tenth of a pound of balanced fertilizer (10-10-10) for each year of tree age, up to 10 years. Iowa State University extension horticulturist Richard Jauron recommends limiting fertilizers to one pound for trees older than ten years. Fertilizer should be spread in the tree’s root zone. Begin sprinkling fertilizer about two feet from the trunk, spreading it in a circular pattern, moving out to where rainwater would drip onto the ground from the farthest branches. Young trees are tasty to wildlife. A fence or other barrier can keep rodents, rabbits and deer from nibbling on or damaging your tree. Spiral trunk guards, made of white plastic, should be removed during the summer to prevent shelter for trunk-boring insects. Ripening fruit will attract birds and deer; it’s not too early to plan your fence, netting or bird scare strategy. Mulch helps discourage weeds, but too much mulch around a fruit tree can actually hamper water penetration and attract rodents and insects. Some mulch, as it decomposes, may compete with the tree for soil nutrients. A good mulching strategy is to rely on a thin layer of compost, like decayed shredded leaves collected with a Cyclone Rake. Inorganic mulches (like plastic landscape fabric) may also be helpful, especially for younger trees; keep such materials tight to the ground to discourage pest penetration. To grow great fruit, you must keep an eye on your trees and their environment –whether or not you decide to use synthetic chemicals to control pests. Integrated pest management is the term professional fruit growers use to describe putting all available tools to work to produce quality fruit. That can range from trapping or picking off threatening insects to using chemical sprays for homeowners. We found a fantastic, free online resource from The Ohio State University that describes good insect and disease control principles. It also links to many other resources. Good information can be obtained locally at garden centers and through master gardener groups and university extension offices. And of course, there’s always the wisdom from friends and neighbors nearby; great gardeners find joy in both growing delicious fruit and showing others how to grow their own. Roses are among the most loved flowering plants, and spring pruning is necessary to keep most varieties blooming. While you should always check your local gardening calendar for proper spring pruning, here are some proven pruning tips to keep roses blooming in landscapes, especially in areas from the Rocky Mountains east to New England. There are two pruning “seasons” for roses. One is spring pruning, just as buds break dormancy. The other pruning happens just after roses flower. The type of rose determines whether the rose needs spring pruning. Repeat bloomers usually need a heavy spring pruning just as the buds break dormancy. Climbers and ramblers, as well as old-fashioned shrub roses, are only pruned after flowering. Other types, especially newer climber/rambler cultivars like climbing hybrid tea roses, need little or minimal pruning. The time has passed in many areas for spring rose pruning. But if you live in a colder zone – or are just a little late to the spring pruning party – here’s a helpful article on spring pruning, from Purdue University. Remove damaged, dying or diseased stems and canes as soon as you spot them. Use a pruning tool that minimizes damage to the rosebush. Pruners that cut like a pair of scissors are usually better than “anvil” style pruners that crush stems. The center of the canes or stems should appear white, not brown, after cutting. If there is brown discoloration, cut more of the stem off. Keep the center of the rosebush open by making pruning cuts above buds set to grow outward from the plant. Seal pruning cuts made on rose canes thicker than a pencil; Clemson recommends using nail polish or wood glue. This will help keep out cane pests. Older climbing/rambling varieties produce the best flowers on one-year old wood. Prune away only the oldest stems, after flowering. Composting is a simple way to improve the health of your garden or yard by adding nutrient-dense mixtures overtop. The best part is it’s 100% free to do and is excellent for the environment. Here’s how to get started composting. A container: Choose a 3’ x 3’ x 3’ container that is made of wood or even hard plastic. For small scale composting recycle an old, large garbage can and simply drill a hole in the bottom of the container for drainage. Find a shady spot: Compost thrives in a shaded environment. Choose an area in your yard that doesn’t get a ton of sun throughout the day. Browns and greens: Browns include leaves, wood chips, straw, branches, and the like. Greens are eggshells, grass, carrot tops and so forth. Manure: This is optional, but ideal if you want to get the most out of your compost. Water hose: You’ll need to water your compost occasionally, so get a water hose if you don’t have one. Pitchfork: Trust us, you’ll want this tool if you’re mixing or moving compost. Compost requires a three to one ratio for browns and greens. Browns are carbon-rich and greens are nitrogen rich. Start by adding those carbon-rich browns to your barrel. Once those are good and packed in. You can start adding your greens. When it’s time to add new material, use your pitchfork, to dig a hole and then add in the new stuff. Mix it thoroughly with the old compost. Finally, add water. You’ll want to do this occasionally to moisten the mixture to keep bacteria and microbes consuming the contents. Include activators like chicken manure, earthworms, and comfrey leaves to help break down the greens and browns. Steaming compost piles are a good sign that your hard work is paying off, so don’t panic if you see it coming from your pile! Reduce odors by leaving out meat scraps and bones in your compost. So, what are you waiting for? Get started with your compost pile by using these helpful tips today! Labels: Compost, compost pile, composting guidelines, composting tips, easy composting, What to compost? Did the leaves where you live seem to be turning late this year? Maybe it seemed they are falling early? Or maybe it’s a combination of the two: The leaves seem to be turning early, but are staying on the trees longer…. It turns out (pun entirely intended) opinions abound about leaves: where the most spectacular foliage is located, when the peak time for viewing turning leaves, how soon and how heavy the leaf fall is. We’re unlikely to settle any debates about where the foliage is most spectacular. But whether talking about sugar maples in New England or aspens in the Rockies, leaf turn and leaf drop depend an awful lot on science. Variations in temperature and moisture are the factors affecting the seasonality of leaf drop the most. Fall’s cooler nights and shorter days trigger trees to begin restricting the flow of water to the leaf. Chlorophyll production is reduced as water flow is reduced, and that loss of chlorophyll results in the leaves turning from green (lots of chlorophyll) to the myriad of fall colors. Leaf turn occurs as chlorophyll production declines. Early freezes, as well droughts in the late summer and early fall, can accelerate the decline of chlorophyll production – and contribute to early leaf drop. Leaf color hues can also be affected by droughts. The whole process is how the tree’s leaves are protected from frost damage – the less water in the leaf, the less damage done by frost. The water flow is reduced to the leaf by a layer of cells at the base of the leaf stem. As these cells block water flow to the leaf, it also allows the leaf to make a clean break from the tree. That’s the point when the Cyclone Rake does its work: collecting the fallen leaves from your yard and landscape. By this time in late October and early November, Cyclone Rake owners are collecting fallen leaves from the yardscape. Wind or rain will accelerate the leaf drop. Chopped leaves can be composted or used to mulch around plantings or as a soil amendment in flower and vegetable gardens. Decaying leaves help raise the amount of organic matter in the soil – providing a basis for beauty in your landscape, just as decaying in the forests feed the forest soil, eventually helping create the fall foliage enjoyed by all. 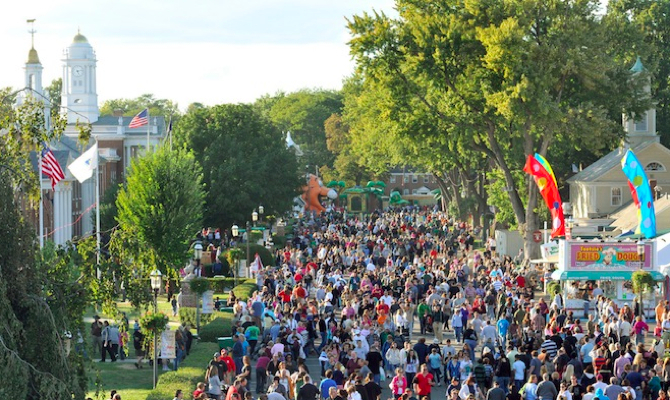 Harvest festivals have ancient roots, but the county agricultural fair is the American forerunner of today’s fall celebrations. They’re especially prevalent in New England, where most towns have some sort of fall country fair. State, regional and county fairs offer all kinds of good family fun (and, of course, plenty of deep fried indulgences). But they also remain one of the best places to connect with the country’s rural roots, as fairs showcase farms and agriculture of all kinds. 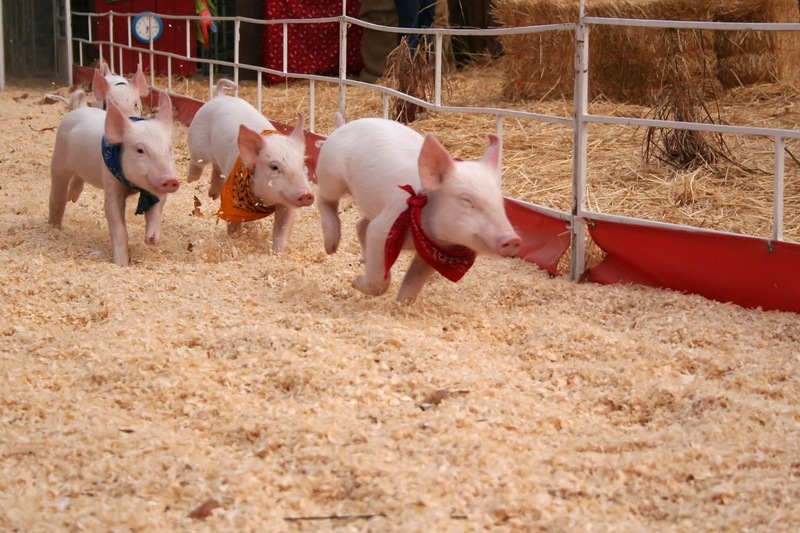 Much of the entertainment at the fair is connected to farming in some way – pig scrambles and the like. The 4-H Club farm animal shows give the public a chance to see how there are differences between food animals on the hoof. Spend time talking with those 4-H Club members in the animal barns, and you’ll discover the care and joy that kids take in raising their livestock and poultry. Other state and county fair events showcase farming traditions. New England’s ox and steer pulls show where horsepower originated. (There’s still time to catch ox pulls at Maine’s largest fair, the Fryeburg Fair, or the Rochester Fair in New Hampshire). Competitive fair rodeos, especially in the South and West, showcase classic cowboy skills still employed on ranches. The fair season is still in full swing across Texas, as the East Texas State Fair celebrates 100 years in Tyler, and the Panhandle South Plains Fair features plenty of entertainment in Lubbock. Fairs and fall festivals also give attenders the chance to connect with where their food comes from – and we’re not just talking fried pies and funnel cakes. Home arts contests show the best produce from local fields and classic food preservation methods. And many more farms, especially those focused on local foods, or “farm to table,” are using fairs and festivals to showcase their offerings. Even local farmers markets take on a more festive feel in the fall, as vendor booths come alive with pumpkins, winter squash of all shapes and sizes, mums and other ornamentals – not to mention sweet lettuce and greens, carrots and other cold-season crops. So whether it’s a huge display, like the Big E in Massachusetts, or your hometown’s fall country fair, take your family to the fair. It’s the best place in the fall to connect with the country’s rural roots – and to see how farmers of all ages, all across the country, are still growing the finest and most delicious food.